Sony today introduced Sony Internet TV, powered by Google TV -- the world’s first television with the ability to watch HDTV, enjoy apps, and browse the Internet seamlessly on one device. The combination of Sony’s hardware and engineering expertise and Google’s understanding of open software provides a unique user experience, merging multiple content sources in one easy-to-use interface. From broadcast to streaming video from the Internet, Sony Internet TV offers the ability to quickly search and watch content from wherever, whenever. 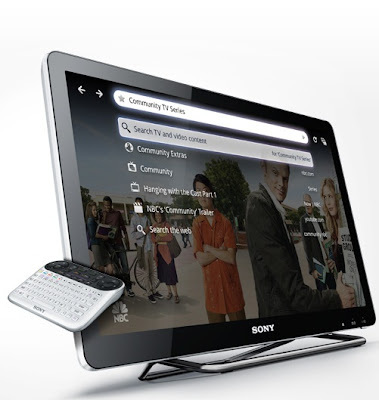 Featuring both integrated television models and a Blu-ray Disc™ player, Sony Internet TV is powered by Google TV. It is built on the Android platform, runs the Google Chrome browser and includes a powerful Intel® Atom® processor offering the ability to quickly search across Internet and television content for easy access to entertainment and information. The models also feature Dual View, allowing users to watch television while tweeting about what they’re watching, checking their fantasy football scores, or finding related content on the web. Ok, guys, to sum up, featuring four LCD HDTVs with Google TV built-in, the Sony Internet TV line includes the 24-inch class NSX-24GT1 ($599.99), the 32-inch class NSX-32GT1 ($799.99), the 40-inch NSX-40GT1 ($999.99), and the 46-inch NSX-46GT1 ($1,399.99). For more specifications and price check out the sony press room page .